A drawing created by Leonardo de Vinci circa 1490. It is accompanied by notes above and below the image, in Leonardo's mirror writing. His image is based on the work of the ancient Roman architect Vitruvius, representing supposedly ideal human proportions — it's also called the Canon of Proportions. In pen and ink on paper, it is stored in the Gallerie dell'Accademia in Venice. As Maria Popova remarked recently, Leonardo's drawing has been regarded as the quintessential symbol of Renaissance breadth of knowledge and accomplishment. I wrote recently, in three posts last autumn, about the life and work of the poet Wislawa Szymborska. (See Wislawa Szymborska, poet, 1923-2012; Stockholm: Wislawa Szymborska and the 1996 Nobel Peace Prize; and The Soul, by Wislawa Szymborska.) If you are unfamiliar with her poems, I hope you will begin to explore them there. Now I've been reading Szymborska again, and some fine critical writing shedding valuable light on her work, in the New York Review of Books as that journal celebrates its 50th anniversary of publication. This new reading offers further appreciation and understanding of her extraordinary poetic imagination. Szymborska is rightly identified as "a poet of consciousness," what Edward Hirsch called "the radical contingency of experience itself." The translations of Szymborska's poetry by Clare Cavanagh and Stanislaw Baranczak are regarded as masterful; they won a 1996 PEN Translation Prize. The volume of Szymborska's poems most often recommended is Poems New and Collected, which also includes her Nobel Prize acceptance speech. "Szymborska was born in 1923 in Bnin, a small town in western Poland, and from early childhood lived in Kraków. She worked on the editorial staff of the cultural weekly Życie Literackie (Literary Life) from 1952 to 1981. Szymborska wrote some twenty books of poetry, was a distinguished translator of French poetry into Polish, and won the Nobel Prize in Literature in 1996, “for poetry that with ironic precision allows the historical and biological context to come to light in fragments of human reality.” She died in February 2012." an inch of landscape tousled by the wind. the memory of happy moments. Editor's note: recently discovered supplementary material has been added at the end of this post. Reprinting an entire newspaper article is hardly the ordinary style of Reckonings, much less an article ten years old. My excuse in this event is that the article is drawn from the archives of The Daily Reprobate, the sister publication of Reckonings for several years but with more distinguished pedigree, having allegedly been founded in 1866 by Mark Twain when he was working as a journalist in San Francisco. If there is a single piece of short fiction that launched Mark Twain's career as a writer, it is surely "The Celebrated Jumping Frog of Calaveras County." In the spring of 2003 a roving correspondent of The Daily Reprobate proposed to his editor an investigative article revealing the fate of jumping frogs in Calaveras County. Despite his reporter's incurable habit of profligacy with his expense account, the editor responded with enthusiasm, hoping for a small boost in circulation. His judgment was not off the mark. The boost, in fact, was not small. Readers of The Reprobate have asked that I reprint the article here, to honor the journal to which those readers remain so loyal, and to preserve a representative piece of Americana. So here is the story in its entirety. Mr. Twain wrote—he would say transcribed—"The Celebrated Jumping Frog of Calaveras County" in his cabin here in 1865, the year before he founded The Daily Reprobate in San Francisco. After that he went on to other things, and in later years did not particularly care for the tale that kindled his fame, or the others with which it appeared in his first book, The Celebrated Jumping Frog Of Calaveras County and Other Sketches (1867). He wrote, "I hate to hear that infamous volume mentioned. I would be glad to know that every copy was burned & gone forever." But the good people of Angels Camp, in their leisurely way, began to awaken to an opportunity to put themselves on the map. Not being the kind of person to pass judgment on one of America's great pastimes—making an enormous amount out of very little and calling it progress—I'll just lay in here last year's poster for the Jubilee, and let it speak for itself. All sorts of information is available on the Frogtown website, which if not quite up to date is up to date enough [it's thoroughly up to date in 2013], and offers a rich fund of information. For example, the world record Frog Jump was set in May of 1986 by "Rosie the Ribiter" jockeyed (yes, that's what it's called these days, and believe me it is delicate and demanding work) by Lee Giudici of Santa Clara, California. "Rosie the Ribiter" jumped an impressive 21 feet 5.75 inches, beating the old world record by 4.75 inches. Pretty decisive, I'd say. Rosie's record has stood now for 17 years. Jockeys come in all ages, from all over creation. The youngest winning jockey--there is considerable advantage in being very light--was Cody Shilts, a 3-year-old from Sacramento, California, in 1994. The wildlife officials were generally reassured after inspecting the "frog condo," where about 300 frogs collected by organizers can be rented by small-time participants, and an operation by a major competitor, John Hand of Sweet Home, Oregon. We at The Reprobate consider the anonymous writer of that report, an unsung stringer for the AP, deserving of recognition by her fellow journalists. She resisted our offers of fame and fortune, and is doubtless the wiser for it. She told us, however, that the editors at the Associated Press had given her a strict word limit, and she was sorry to have to cut out the part about the animal rights activists. We offered her a chance--small recompense for her hospitality--to sneak it in here as a coda. Animal rights activists, unlike Fish and Game, with whom they are not on speaking terms, want just to shut the whole contest down because of its cruelty to frogs. The activists' main spokesperson this year was Ms. Larisa Briski, who ironically happened to be the 1988 Miss Calaveras County and used to participate in the frog contest. One could tell by her passion that she had first hand experience. "I learned from my own mistakes... These poor frogs are sort of dragged out of nature and then made to jump on command, more or less, on a stage in front of a big crowd of people in the summer sun. This, to any animal rights activist, is cruel and unnecessary." Each year about $40 million worth of frog legs are traded internationally. Frog muscle does not resolve rigor mortis as quickly as warm-blooded muscle (chicken, for example), so heat from cooking can cause fresh frog legs to twitch. The least we can do, then, is to show our readers The New Yorker's portrait of The Green Hornet. RIP, old friend. 2013 note: As readers may have suspected, Frogtown lives. 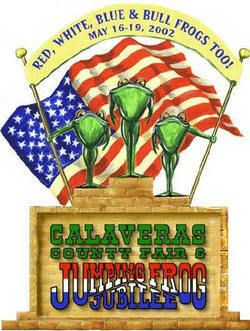 May 16-19, 2013, "The Calaveras County Fair & Jumping Frog Jubilee is one of the longest running events in the State of California. Its earliest roots date back to 1893, held that year in Copperopolis, the fair eventually found a permanent home outside of Angels Camp. In the spirit of the old movie classic "State Fair," the Calaveras County Fair is a blend of entertainment, exhibits, livestock, arena events, great food and our signature event, the Frog Jump. This piece of Americana will have you Leaping to return year after year." Angels Camp, also known as City of Angels and formerly Angel's Camp, Angels, Angels City, Carson's Creek, and Clearlake, is the only incorporated city in Calaveras County, California, occupying — if that's the word — a generous three square miles. Its population is in the neighborhood of 3,000, give or take. Pile the kids into the SUV and enjoy the festivities. Wise to call for reservations: 800-CALFROG. We have lived our lives by the assumption that what was good for us was good for the world. We must change our lives so that it will be possible to live by the contrary assumption, that what is good for the world will be good for us. And that requires that we make the effort to know the world and learn what is good for it. "Interbeing" is an awkward coinage but an essential concept, rebalancing our lives in ways suggested by Wendell Berry. In the words of the Buddhist monk Thich Nhat Hanh, "Not only is no man an island, but rather his interbeing is shared with the plants and animals he eats, the people who make his clothes and food, the people who populate his home, country and the very world he percieves, the insects that pollinate the trees that yeild his fruit, shade him from the sun, and provide lumber for his house." Bill Moyers's program this week offered responses to the conceptual challenge Wendell Berry and Thich Nhat Hanh describe. Moyers includes a short film, "The Dance of the Honeybee," because honeybees are a kind of exemplary species for us. If they're in trouble, so are we. Interbeing compels us to shape those words into a circle of interdependence: If we're in trouble, so are they. Their trouble is ours, and ours is theirs. Their lives and ours are interactive. We are among their others, they are among our others. "The U.S. Department of Agriculture says a quarter of the American diet, many of our fruits and vegetables especially, rely on pollination by honeybees. But something is killing them at an accelerated pace and it’s getting worse. Forty to fifty percent of the hives have been wiped out. "More and more, the leading suspect is certain pesticides, fungicides and herbicides, singly or in combination, that appear to be slaughtering bees outright or affecting brain and nerve functions. Beekeepers and activist groups are suing the Environmental Protection Agency to ban a kind of pesticide known as neonicotinoids. "Not only are we dependent on the honeybee for much of what we eat. There is a grace and elegance they bring to the natural world that would diminish us all were they to disappear." Exciting work is afoot with the potential to have a major impact on education in the US and abroad, an auspicious marker event in our "information age." The Digital Public Library of America will be formally launched on April 18. [The DPLA] is a project to make the holdings of America’s research libraries, archives, and museums available to all Americans—and eventually to everyone in the world—online and free of charge. How is that possible?... Speaking broadly, the DPLA represents the confluence of two currents that have shaped American civilization: utopianism and pragmatism. How do these two tendencies converge in the Digital Public Library of America? For all its futuristic technology, the DPLAharkens back to the eighteenth century. What could be more utopian than a project to make the cultural heritage of humanity available to all humans? What could be more pragmatic than the designing of a system to link up millions of megabytes and deliver them to readers in the form of easily accessible texts? Thanks to the Internet and a pervasive if imperfect system of education, we now can realize the dream of Jefferson and Franklin. We have the technological and economic resources to make all the collections of all our libraries accessible to all our fellow citizens—and to everyone everywhere with access to the World Wide Web. That is the mission of the DPLA. The DPLA has designed its infrastructure to be interoperable with that of Europeana, a super aggregator sponsored by the European Union, which coordinates linkages among the collections of twenty-seven European countries. Within a generation, there should be a worldwide network that will bring nearly all the holdings of all libraries and museums within the range of nearly everyone on the globe. To provide a glimpse into this future, Europeana and the DPLA have produced a joint digital exhibition about immigration from Europe to the US, which will be accessible online at the time of the April 18 launch. Several of the country’s greatest libraries and museums—among them Harvard, the New York Public Library, and the Smithsonian—are prepared to make a selection of their collections available to the public through the DPLA. Those works will be accessible to everyone online at the launch on April 18, but they are only the beginning of aggregated offerings that will grow organically as far as the budget and copyright laws permit. Of course, growth must be sustainable. But the greatest foundations in the country have expressed sympathy for the project. Several of them—the Sloan, Arcadia, Knight, and Soros foundations in addition to the National Endowment for the Humanities and the Institute of Museum and Library Services—have financed the first three years of the DPLA’s existence. If a dozen foundations combined forces, allotting a set amount from each to an annual budget, they could create the digital equivalent of the Library of Congress within a decade. And the sponsors naturally hope that the Library of Congress also will participate in the DPLA. How will such material be put to use? I would like to end with a final example. About 14 million students are struggling to get an education in community colleges—at least as many as those enrolled in all the country’s four-year colleges and universities. But many of them—and many more students in high schools—do not have access to a decent library. The DPLA can provide them with a spectacular digital collection, and it can tailor its offering to their needs. Many primers and reference works on subjects such as mathematics and agronomy are still valuable, even though their copyrights have expired. With expert editing, they could be adapted to introductory courses and combined in a reference library for beginners. At one time or other, nearly every student comes in contact with a poem by Emily Dickinson, who probably qualifies as America’s favorite poet. But Dickinson’s poems are especially problematic. Only a few of them, horribly mangled, were published in her lifetime. Nearly all the manuscript copies are stored in Harvard’s Houghton Library, and they pose important puzzles, because they contain quirky punctuation, capitalization, spacing, and other touches that have profound implications for their meaning. Harvard has digitized the originals, combined them with the most important printed editions (one edited by Thomas H. Johnson in 1955 and one edited by Ralph W. Franklin in 1981), and added supplementary documentation in an Emily Dickinson Archive, which it will make available through its own website and the DPLA. "Once upon a time I was a political cartoonist...but had trouble making witty, incisive jokes; as a small rebellion against deadlines, punchlines and politics...I drew what I thought was an absurd, irresponsible triviality. It showed a man riding towards the sunset on a large duck. On his head was a teapot...not a 'proper' cartoon by conventional standards...the editor laughed, shook his head and published it. Many years later I was able to interpret the meaning of the drawing with certitude...the man was most definitely me and the teapot, worn like a fool's cap, symbolised warmth, nourishment and domestic familiarity...the duck represented feelings of primal freedom and playfulness..innocently I had drawn my impending departure from political cartooning, my flight to freedom." I can't find the original drawing of which Leunig writes. Let's say the one I found (above) is a successor self-portrait. The duck grew tired of being ridden by a man. They continue their journey together. Some time later the duck turns and looks at the man, who responds. "In the artist of all kinds one can detect an inherent dilema which belongs to the co-existence of two trends; the urgent need to communicate and the still more urgent need not to be found." Linda Hogan, one of our most respected Native writers and Writer in Residence for The Chickasaw Nation, captures the wonder of sandhill cranes in this fine poem. "As far as you can see / the ancient story made new." of life they write across the sky. the ancient story made new. The Platte River Valley of central Nebraska is a stopover for more than a half million sandhill cranes as they make their way north from Texas, Oklahoma or Mexico. Each gray bird, with its distinctive red forehead, will stay for several weeks before resuming its long migration to nesting areas in the Arctic. "Mated pairs of cranes... engage in unison calling, which is a complex and extended series of coordinated calls. While calling, cranes stand in an upright posture, usually with their heads thrown back and beaks skyward during the display. In Sandhill Cranes the female initiates the display and utters two, higher-pitched calls for each male call. While calling, the female raises her beak about 45 degrees above the horizontal while the male raises his bill to a vertical position. All cranes engage in dancing, which includes various behaviors such as bowing, jumping, running, stick or grass tossing, as well as wing flapping. Though it is commonly associated with courtship, dancing can occur at any age and season. Dancing is generally believed to be a normal part of motor development for cranes and thwarts aggression, relieves tension, and strengthens the pair bond." Four days ago the writer Ruth Prawer Jhabvala died at the age of eighty-five. She was a gifted and eloquent writer of stories, novels and screenplays, thoroughly at home in her craft, which was deeply evocative of human life and relationships. Her beautiful screenplay adaptations of E.M. Forster's novels, A Room with a View and Howard’s End, deservedly won two Oscars; and her eighth novel, Heat and Dust, received the Booker Prize in 1975. Ruth Prawer Jhabvala's stories often appeared in The New Yorker, and the following tribute was written for that magazine by Joshua Rothman. "One of Jhabvala’s short-story collections, published in 1998, is called East Into Upper East. The title is a play on her own life story: starting in the seventies, she split her time between New York and New Delhi. But, in fact, that understates her geographical range. Ruth Prawer was born into a Jewish family in Cologne, Germany, in 1927. Her father, Marcus, was a lawyer, and originally from Poland; her grandfather on her mother’s side was cantor of a large Cologne synagogue. In 1939, the family fled the Nazis and landed in London. It wasn’t until 1948 that her father learned the fate of his Polish relatives; when he discovered that they had all died in concentration camps, he committed suicide. "Ruth went on to live an international life. She earned a degree in English Literature at Queen Mary College, London University, and in 1951 she married Cyrus Jhabvala, an architect. Together, they moved to Delhi, where they raised three daughters, who are now married to an Indian, an American, and an Englishman. She had never felt quite settled in India, and eventually she moved to New York. "In a 1979 lecture, Jhabvala spoke about her rootlessness. She shared her admiration for writing that emerged from a sense of tradition and landscape, but she herself felt rootless: 'I stand before you as a writer without any ground of being out of which to write: really blown about from country to country, culture to culture, till I feel—till I am—nothing.' And yet, she said, this was one of her strengths. Many of her stories are about a kind of inner travel: feeling rootless, her protagonists find new ways to feel at home in the worlds they happen to inhabit. In 'The Teacher,' one of her recent stories for The New Yorker, a woman living alone in upstate New York becomes friends with a fraudulent guru; perhaps because his ideas are nonsense, she finds herself making sense of her own life. In 'The Judge’s Will,' a woman meets her husband’s long-time mistress, and the encounter pushes her to see her husband and son in a new, and possibly more rewarding and realistic, way. "[The New Yorker has] unlocked six of Jhabvala’s stories: 'The Judge’s Will,' 'The Teacher,' 'Aphrodisiac,' and 'Innocence,' which have all been published recently, along with 'On Bail,' from 1973, and 'The Interview,' from 1957, which was Jhabvala’s first story for The New Yorker. And subscribers can read all of her stories in our online archive." Photograph, of Ruth Prawer Jhabvala in 1979, courtesy of Camera Press/Redux. My grandmother, Eleanor Roosevelt, was instrumental in adoption by the United Nations of The Universal Declaration of Human Rights. She was my first and most influential mentor, whose home became mine in my formative undergraduate years at Amherst College. Her compassion and canny wisdom, her belief in the United Nations, social justice and human rights, fed me and shaped my values and choices. I didn’t begin those undergraduate years with social conscience or consciousness, at least none focused or articulate. Thanks largely to her I developed some measure of both. In my adult years, particularly as Professor of Human Development at Hampshire College, I sought to nourish in succeeding generations of students a deeper knowledge and conscious embodiment of their own and engagement with others' life journeys. Later, I became convinced of the need for a more capacious understanding of human development, rights and responsibilities — our need to nourish a movement based not only on human rights but the rights of all sentient beings - all life, as we are essentially one interactive interdependent ecosystem. As John Muir wrote, "When we try to pick out anything by itself, we find it hitched to everything else in the universe." It is a perspective common to the world's religions - especially Buddhism's conception of co-evolution and the sacred traditions of indigenous cultures. Like evolution and hope, it arises from the bottom up. Paul Hawken began his book Blessed Unrest (2007) with an overview of a world-wide movement devoted to re-imagining and recovering social justice and environmental sustainability, in his view an organic and sacred web of tasks entailing "deep listening" as well as activism, essentially "restoring grace, justice and beauty to the world." They are ancient tasks of compassion possessed of an entirely new urgency, for "the planet has a life-threatening disease, marked by massive ecological degradation and rapid climate change," fueled by thoughtless consumption and the rapaciousness of a capitalist fundamentalism devoted not to true sustenance but to a narrow conception of economic growth. Whether such a diverse and loose collectivity of creative and resistant enterprise deserves the name movement is a matter of personal judgement; but with Hawken I think it is more than that, not less. It is, as he realized, not a singular enterprise, nor is it driven by a singular ideology. Readers of Reckonings will know that I am drawn to one use of the word "movement"--the progressive development of a musical composition, a poem or story. In that sense, writ large, movement is coextant with the generative and regenerative character of life itself. movement embodied in a gathering, predominantly of women, in Moab, Utah during the autumn of 2012. The gathering was called a Women's Congress for Future Generations. Their purpose was to begin work on a Declaration of the Rights Held by Future Generations and Bill of Responsibilities for Present Generations. "This document," say its creators, "is not so much a product as a reflection of a process of relationship and movement building," so necessarily "a living draft... working documents to be amended in perpetuity, as an ever-widening circle add their voices to these statements, and as these rights and responsibilities are passed down from generation to generation." A first working draft of the preamble and principles "was written collaboratively by Carolyn Raffensperger, Executive Director of the Science and Environmental Health Network, in conversation with Bob Gough, Osprey Oreille Lake, Polly Higgins, Peter Montague and Rebecca Altman in advance of the Moab gathering to facilitate group discussion. The rights and responsibilities were distilled from discussions held at the Moab Congress on the gifts and rights of all beings and the responsibilities present generations carry to honor those gifts and rights." I invite readers of Reckonings to read that first draft, join in the challenges of its ongoing development, find their own ways of translating these working ideas into personal, interpersonal and organizational action. I would be very interested to know if/how such translation shows promise and works in your own local circumstances. The blog in which the text (and some very preliminary sense of its evolution) may be found is available at http://celebratewcffg.wordpress.com/2012/11/19/declaration-of-the-rights-held-by-future-generations-and-bill-of-responsibilities-for-present-generations/.